The offshore-islands of Antigua are habitat for endemic and globally threatened wildlife. Offshore-islands within the North East Marine Management Area have earned designations such as Key Biodiversity Area, Important Bird Area, and Alliance for Zero Extinction Site. This project will increase local knowledge and conservation of a vulnerable duck species, the West Indian whistling duck (Dendrocyna arborea). We will test and implement bird monitoring techniques (banding, nest searches, use of camera traps), along with executing biosecurity monitoring and conducting environmental education campaigns in local schools and among tour-operators and fishers. 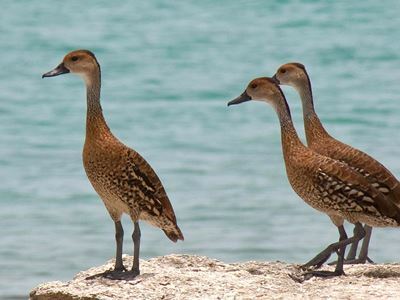 On completion of the project, it is expected that residents, fishers and tour-operators will have a better understanding of whistling ducks, their habitat, and their importance. Additionally, the project team will have increased monitoring capacity, and have a clearer understanding of the duck’s distribution and nesting success. We also anticipate that the local government’s decisions for or against the conservation of local wildlife will be influenced by the information gathered and shared. Additionally, we shall note a positive change in people’s behaviour towards wildlife. Thus, this project will contribute to the bigger picture of conserving local natural heritage for the future of Antigua’s off-shore islands.